57% of U.S. adults say they’re equally worried about men facing false allegations of sexual assault as they are regarding women facing sexual assault. 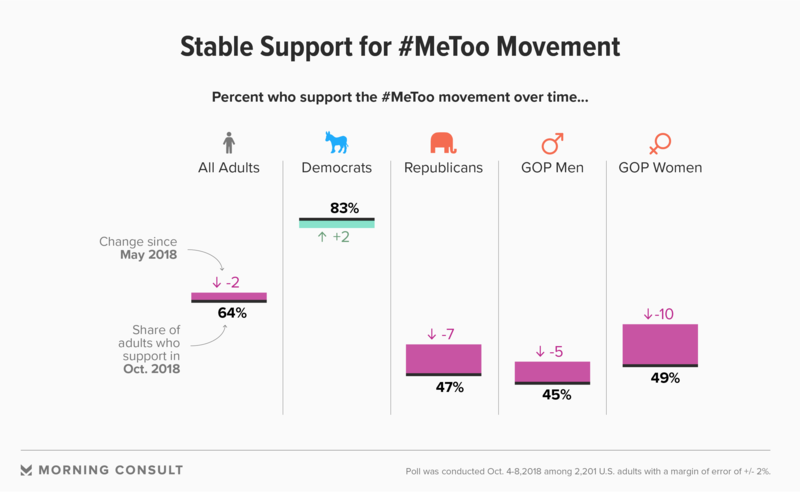 Republican support for the #MeToo movement has dropped 7 points in five months, from 54% to 47%. About a year after the #MeToo movement gained prominence, a new poll finds most of the public is equally concerned for young men facing possible false allegations as they are for young women facing sexual assault. The Morning Consult survey follows the divisive nomination of Supreme Court Justice Brett Kavanaugh, who, during a charged Senate hearing, mourned the damage to his reputation after several women accused him of sexual harassment or assault, which Kavanaugh denied. He was confirmed to sit on the country’s highest court Saturday. Fifty-seven percent of U.S. adults in the Oct. 4-8 survey said the #MeToo movement, which sought to draw attention to sexual harassment and assault, has made them equally concerned for young men facing false accusations and for women facing sexual harassment and assault. That includes 58 percent of Republicans and 54 percent of Democrats. Seventeen percent said they’re more concerned for women, while 15 percent said they’re more concerned for men. The survey was among 2,201 U.S. adults and has a margin of error of 2 percentage points. Jennifer Drobac, a law professor at Indiana University specializing in sexual harassment law, said the sympathy for young men facing potentially false accusations reveals a society sensing a possible shift in power. Actress and activist Alyssa Milano jump-started the movement on Oct. 15, 2017 with a tweet asking her followers to reply “me too” if they had been sexually harassed or assaulted. Milano was tweeting in the wake of the Harvey Weinstein scandal, when The New York Times and the New Yorker exposed the powerful producer’s decades-long history of predatory behavior. Over the next six months, the#MeToo hashtag was used on Twitter an average of 61,911 times per day, according to a Pew analysis. Asked in slightly different way, the survey also shows the level of concern generated by the #MeToo movement has spread across the political spectrum — for both potential victims and the potential accused. 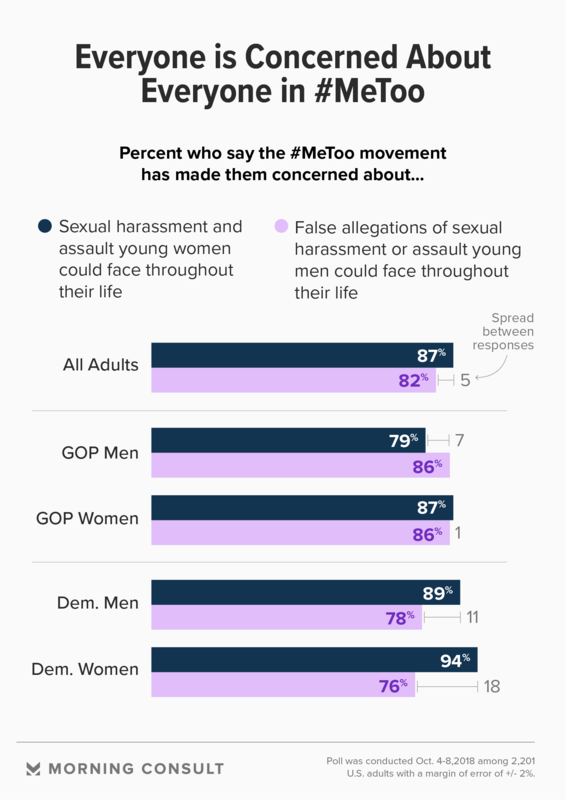 More than three-quarters of Republicans and Democrats, including partisan men and women, are concerned about sexual assault and false accusations that women and men, respectively, face throughout their lives. Among the gender subgroups, Republican men were the only ones more concerned about men facing false accusations than about women facing sexual assault, beyond the margin of error: 86 percent to 79 percent. Between 2 and 10 percent of sexual assaults are falsely reported, according to a 2012 report from the National Sexual Violence Resource Center, while an estimated 63 percent of sexual assaults are never reported to the police. While the survey only asked about women, who over their lifetimes are twice as likely to be victims of sexual violence than men, one in six men will also experience sexual violence in their life, per the 2010-2012 National Intimate Partner and Sexual Violence Survey. Overall, approval for the movement aimed at bringing attention to sexual harassment and assault has not shifted since the spring. 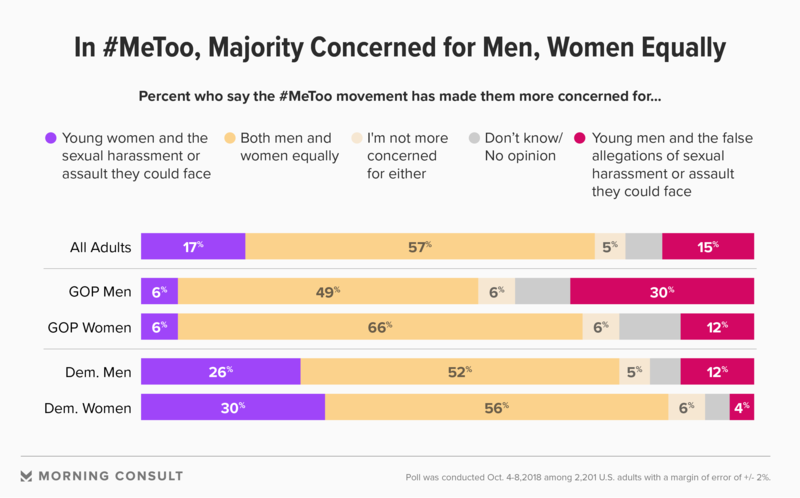 Sixty-four percent of the public supports the #MeToo movement, compared to 66 percent in May. The only group that has seen a drop in support outside the margin of error is Republicans, whose support for #MeToo has dropped 7 points in five months, to 47 percent, including a 10-point drop among Republican women, to 49 percent. Thirty-one percent of Republican women say the movement represents their interests, an 8-point drop since March and below the 54 percent of women overall who say the same.